For the nuclear power station in Trino Vercellese, Italy, see Enrico Fermi Nuclear Power Plant (Italy). 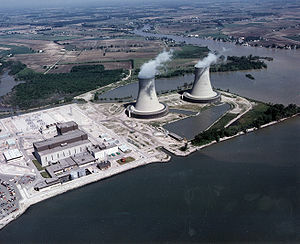 The Enrico Fermi Nuclear Generating Station is a nuclear power plant on the shore of Lake Erie near Monroe, in Frenchtown Charter Township, Michigan on approximately 1,000 acres. All units of the plant are operated by the DTE Energy Electric Company and owned (100 percent) by parent company DTE Energy. It is approximately halfway between Detroit, Michigan, and Toledo, Ohio. It is also visible from parts of Amherstburg and Colchester, Ontario as well as on the shore of Lake Erie in Ottawa County, Ohio along with Ohio Turnpike. Two units have been constructed on this site. The first unit's construction started on August 4, 1956 and reached initial criticality on August 23, 1963, and the second unit received its construction permit on September 26, 1972. It reached criticality (head on) in June 21, 1985 and was declared commercial on November 18, 1988. The plant is connected to two single-circuit 345 kV Transmission Lines and 3 120 kV lines. They are operated and maintained by ITC Transmission. On October 5, 1966, Fermi 1, a prototype fast breeder reactor, suffered a partial fuel meltdown, although no radioactive material was released. After repairs it was shut down by 1972. On August 8, 2008, John McCain was taken on a 45-minute tour of the plant, becoming the first actively campaigning presidential candidate to visit a nuclear plant. The 69 MWe prototype fast breeder reactor Fermi 1 unit was under construction and development at the site from 1956 to 1963. Initial criticality was achieved on August 23, 1963. On October 5, 1966 Fermi 1 suffered a partial fuel meltdown. Two of the 92 fuel assemblies were partially damaged. According to the United States Nuclear Regulatory Commission, there was no abnormal radioactivity released to the environment. Fermi 1 was a liquid metal (sodium) cooled fast breeder reactor design. It was capable of producing 200 megawatts thermal (MWt) power or 69 MW electrical power with 26% enriched metallic uranium fuel. The enriched uranium section of the reactor (core) was a 30 inch in diameter cylinder by 30 inches high and contained 92 fuel assemblies. The core was surrounded by 548 additional assemblies containing depleted uranium. These assemblies were about 2.5 inches square by about 8 feet tall. Only the core section contained the enriched uranium while depleted uranium was placed above and below within the assemblies. The core also contained 2 control rods and 8 safety rods. The plant was designed for 430 MWt and 125 MWe using a newer uranium oxide fuel, but the plant was closed before the fuel was ever ordered. The shield plug was a rotating part of the inner reactor vessel and sat over the fuel. It could be rotated in order to facilitate fuel movements. The shield plug also provided radioactive shielding. During fuel loading, new assemblies were lowered down a tube into an adjacent Transfer Rotor which was integral with the reactor vessel. Then an Offset Handling Mechanism lifted the assembly from the Transfer Rotor and placed it into the vessel. Once all of the assemblies were loaded, a Hold Down Mechanism sat atop them so as to prevent them from moving upwards during operation. The Hold Down Mechanism also contained temperature measuring devices (resistance temperature detectors) to monitor sodium outlet temperatures from the assemblies. The (primary) sodium which flowed through the core exchanged heat with a secondary sodium system which then exited the containment. The secondary sodium then passed through the tube side of 3 parallel steam generators and transferred heat to water on the shell side. The “once through” design produced superheated steam which turned the main turbine-generator. A 168 MWe oil-fired boiler was added in 1966 to utilize the turbine-generator during periods when the reactor was not producing power. The main cause of the partial meltdown was due to a temperature increase caused by a blockage in one of the lower support plate orifices that allowed the flow of liquid sodium into the reactor. The blockage caused an insufficient amount of coolant to enter the fuel assembly; this was not noticed by the operators until the core temperature alarms sounded. Several fuel rod subassemblies reached high temperatures of around 700 °F (370 °C) (with an expected range near 580 °F, 304 °C), causing them to melt. Following an extended shutdown that involved fuel replacement, repairs to vessel, and cleanup, Fermi 1 restarted in July 1970 and reached full power. Due of lack of funds and aging equipment it was finally shut down permanently on November 27, 1972, and was officially decommissioned December 31, 1975 under the definition of the Atomic Energy Commission. Later, the Nuclear Energy Commission replaced the AEC and under their new definitions, Fermi was re-designated as being in SAFSTOR due to some remaining radioactivity at the site. On May 16, 1996, decommissioning was restarted. However, by November 2011 with very little activity remaining, a decision was made to halt further work. It is currently in SAFSTOR. A number of accounts of the accident are available. One book is Fermi-1 New Age for Nuclear Power and published by the American Nuclear Society in 1979. A book, We Almost Lost Detroit, was written by local Detroit newsman John Grant Fuller (subtitled "This Is Not A Novel" to point out that it was not a work of fiction). The song "We Almost Lost Detroit", by Gil Scott-Heron is also about the Fermi 1 meltdown. Fermi 2 is a 1,198 MWe General Electric boiling water reactor owned and operated by DTE Energy. Plans to build were announced in July 1968. Initial criticality was achieved in July 1985, and full commercial operation commenced on January 23, 1988. The reactor vessel holds 764 fuel assemblies and 185 control rods which modulate the power. The fuel assemblies are about 6 inches square by about 12 feet long. The turbine generator is an English Electric unit, but the company changed its name to General Electric Company later. Water flowing through the reactor vessel changes to saturated steam and then travels to the main turbine-generator to produce electricity. After that, the steam drops into a main condenser where it is condensed to liquid water and is recycled. A secondary loop of water which enters the tube side of the condenser is non-radioactive. It flows to two large cooling towers which stand 400 feet tall where the hot water is cooled by natural circulation with ambient air. This is a closed loop with only a small amount of make-up water needed from Lake Erie to replace any evaporation. Two 345 kV lines send power to the customers. Those same lines are used to supply electricity to the site's safety equipment. Three additional 120 kV lines are also available to supply any needed back-up power to safety equipment. Additionally, four diesel generators and four combustion turbine generators are on site to power plant safety equipment during an emergency. The original Fermi 3 project was to be a companion unit identical to Fermi 2. It was ordered in 1972 and cancelled in 1974. See DOE data page 67 and WNA Fermi 3 data. In September 2008, Detroit Edison filed an application with the Nuclear Regulatory Commission (NRC) for a Combined Construction and Operating License (COL) for a third reactor. The new unit is supposed to be built on the same site, slightly to the southwest of Fermi 2. The reactor design selected is the 1,550 MWe GE-designed passive Economic Simplified Boiling Water Reactor (ESBWR). Review of the 17,000-page application could take four years, after which construction could take six years. The cost is estimated at as much as $10 billion. CEO Anthony Earley said that DTE's analysis "so far shows that nuclear power will, over the long term, be the most cost-effective baseload option for our customers, ... We expect nuclear to remain the low-cost option, but we will continue to evaluate nuclear against other resources and will commit to proceeding with construction only at the right time and at the right cost". In March 2009, a coalition of citizen groups asked federal regulators to reject plans for Fermi 3, contending that it would pose a range of threats to public health and the environment. The groups have filed 14 contentions with the NRC, claiming that a new plant would pose "radioactive, toxic and thermal impacts on Lake Erie's vulnerable western basin." In May 2015, the Nuclear Regulatory Commission approved a combined construction and operating license for Fermi 3, but DTE Energy stated there were no plans for construction at that time. The Nuclear Regulatory Commission's 2010 estimate of the risk each year of an earthquake intense enough to cause core damage to the reactor at Fermi was 1 in 238,095 making it the 88th least likely to be damaged of all US nuclear generating stations. The Enrico Fermi Nuclear Generating Station consists of one operational reactor, one closed unit and one additional is planned. ^ NucNet. McCain Reiterates Support For Nuclear During Enrico Fermi Visit. August 8, 2008. ^ a b c NRC "Fermi, Unit 1", NRC Website, 3 February 2011, accessed 17 March 2011. ^ Spignesi, Stephen J. (December 1, 2004). Catastrophe! : The 100 Greatest Disasters Of All Time. Citadel Press. p. 304. ISBN 978-0806525587. ^ NRC "Fermi, Unit 2", NRC Website, 13 January 2011, accessed 17 March 2011. ^ "Fermi, Unit 3 Application". U.S. Nuclear Regulatory Commission (NRC). 2008-09-19. Retrieved 2008-09-19. ^ Lam, Tina (2008-09-19). "DTE applies for another nuclear plant". Detroit Free Press. Archived from the original on January 12, 2015. Retrieved 2008-09-19. ^ Dolley, Steven (2008-09-18). "Detroit Edison files with NRC for license to build new nuke unit". Platts Nucleonics Week. McGraw-Hill. Retrieved 2008-09-19. Some notes written by hands on principal engineer who worked at the site from 1967 to 2006. Wikimedia Commons has media related to Enrico Fermi Nuclear Generating Station. Public Comments "Public Comments at the meeting re: FERMI 3 with the NRC. This includes youtube videos of speakers calling for an end to the new nuclear reactor project. Featured are a Professor from the U of M, Don't Waste Michigan members, Sierra Club members, and other concerned citizens."